Overview – How Can Volcano Classic Vaporizer Help You? 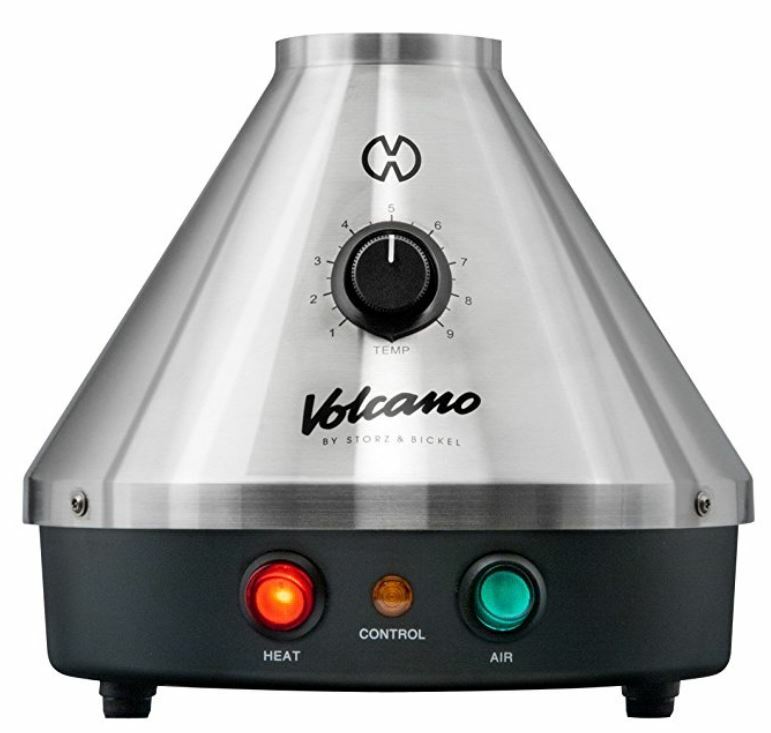 Volcano Classic Vaporizer will provide you with a great experience in vaping medical marijuana herbs and waxes. Welcome to our Volcano Classic Vaporizer review. Through this article, I’m going to review one of the best and most popular desktop vaporizers on the market – the Volcano Classic Vaporizer. It has all that you need for a wonderful experience vaping medical marijuana and waxes to relieve pain or any other disease for which you need medical marijuana. The Volcano Classic Vaporizer, manufactured by the German company Storz & Bickel, is one of the oldest desktop vaporizers on the market. Despite being released almost 10 years ago it’s still one of the finest products on the market. This is a testament to its high quality and durability. Only such quality products can withstand the test of time. One of the best things about the Volcano Classic Vaporizer is that the vapor it produces is completely free of all the harmful irritants that are found in smoke. The vapor is also extremely pure as it is 95% composed of the active ingredients found in the herb. The device uses a balloon bag system. You can attach a balloon bag to it for a short while in order to fill it with vapor. Then you can consume the vapor from the balloon bag with ease using the mouthpiece on the bag. These balloon bags can store vapor for about 8 hours. Despite this feature, it’s still considered a desktop vaporizer. It is not meant for mobile use; but rather restricted to home use. 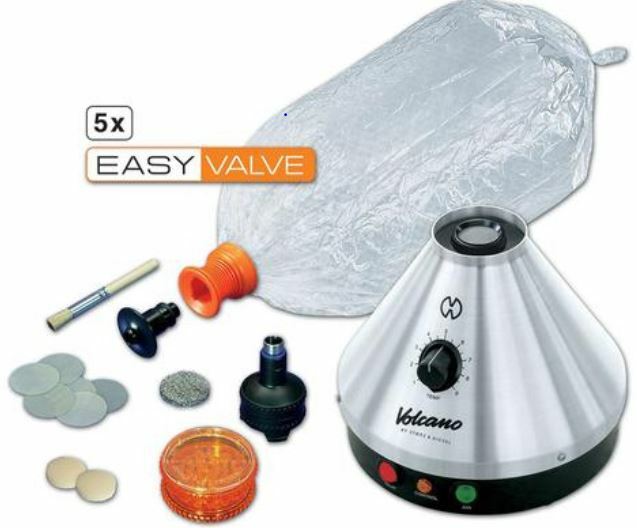 When you purchase the Volcano Classic Vaporizer you’ll get 5 balloon bags and one filling chamber. The filling chamber can be used for a very long time. You just need to clean it every now and then. Each balloon bag will last you 50 to 100 uses; after which you’ll need to replace it with a new bag. So we’re talking about 500 free balloon bag uses before you need to start buying extras bags. If you’re thinking that since this is called the “classic” model, there must be an “electronic” model – you’re absolutely right. The main difference between the two models is the temperature selection system. In the classic model you get a dial that you adjust to one of nine temperature settings according to how you prefer your vapor. The electronic model’s temperature is adjusted digitally. Once you adjust the temperature to your liking, you’ll choose between a set of three lights. 1.The first light/switch is red and labeled “HEAT.” This means that the vaporizer is working towards raising the temperature to what you selected. 2.The second light/switch which is green in color and labeled “AIR” will direct the vapor into the heater in order to fill any attached balloon bags. 3.Finally, there’s a yellow light that’s turned on to let you know the unit is heating. It switches off once your selected temperature is reached. Make sure to clean the device regularly to keep it in optimum condition. The cleaning process is easy and straightforward, but can easily be forgotten. The device has a 3 year warranty that you’re likely not to need. Using the Volcano Classic Vaporizer is straightforward. You’ll get used to it in almost no time. • Remove the filling chamber insert. • Grind the herbs/medical marijuana and place them at the bottom of the filling chamber. • If you would like to use concentrates you can apply them to the Volcano Plenty Liquid Pad. • Add the filling chamber insert back again as it secures the herbs in the chamber and keeps the vapor consistent. • Press down on the chamber insert lightly in order to compress the herbs or marijuana. • Place the chamber on the heating element. • Attach the solid valve attachment to the chamber to fill up a balloon. • Flip on the green switch that was described earlier. • After about 40 seconds the balloon should fill up. 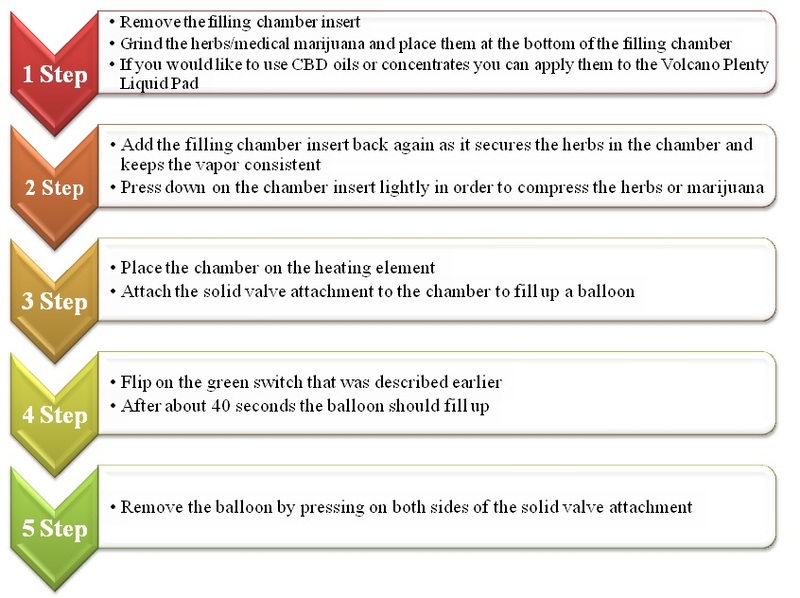 • Remove the balloon by pressing on both sides of the solid valve attachment. 1. Grind and stir the herbs as much as possible before inserting them. 2. Avoid overusing the components of the vaporizer and clean the filling chamber. The unit’s exceptional number of pros sets it apart from its competitors. 1. Can be used for herbs and concentrates using Volcano Plenty Liquid Pads. 7. Only takes about 40 seconds to fill up a balloon bag. 8. Balloons store vapor for up to 8 hours. 3.Takes 3 minutes to heat up. 4. Noise while filling up balloons. Volcano Classic Vaporizer customer service is provided by NamasteVaporizers.com via e-mail, chat, and phone line. You’ll rarely need to call customer support as the product is of very high quality and excellently manufactured. On the rare occasion that you do need assistance, customer support is very helpful according to user reviews. Our final verdict is that this is by far one of the best vaporizers on the market in both desktop and portable categories. It’s been around for a long time and is still in demand to this day. There are hundreds of great reviews on the Volcano Classic Vaporizer out there and very few complaints. Its balloon filling up system is the fastest on the market. It also provides the best vaping experience as it produces the best vape when it comes to quality, density, and taste. Perhaps its only drawback is that it’s somewhat expensive. However, considering its quality, you should look at it as an investment. You’re going to have it for several years and it’ll provide you with amazing vaping sessions. For all of these reasons we’ve given the Volcano Classic Vaporizer a 4.9/5 rating. If you’re a medical marijuana user, and you’re looking for one of the highest quality vaping devices that’ll last you several years, this should be at the top of your list. It works really well with both herbs and concentrates. Have you tried the Volcano Classic Vaporizer ? Let us know what you think! Hello, I am a new medical marijuana patient. I cannot afford this Volcano vaporizer now. Do you have Any recommendations for a cheaper but still decent quality one? Mark..I would recommend looking at Da Buddha or Arizer Extreme Q Viporizer. They are both less than 200$ and good to use for herbs. If you need to use oils or concentrate, you might look at Plenty vaporizer (around 250$). Please find more information about these desktop vaporizers here. Hi John, I still cannot decide between a new and classic old Volcano. Except that digital temperature regulator and price, I could find the difference. What would you recommend? Angie..I have been using the classic model Volcano for the last 5 years and never had an issue. Digital screen looks fancy, but this does not make the vape quality better. So, you can save some money by just getting the classic version.